Congrats on the GDT!! That is AWESOME!! I absolutely LOVEEEEEEEEE these!! So fun and festive!!!!!!!! Adorable! Thank you for Linking Up at PDE Linky Party. Morning my sweet friend!! These are just so super ADORABLE!!!!!!! 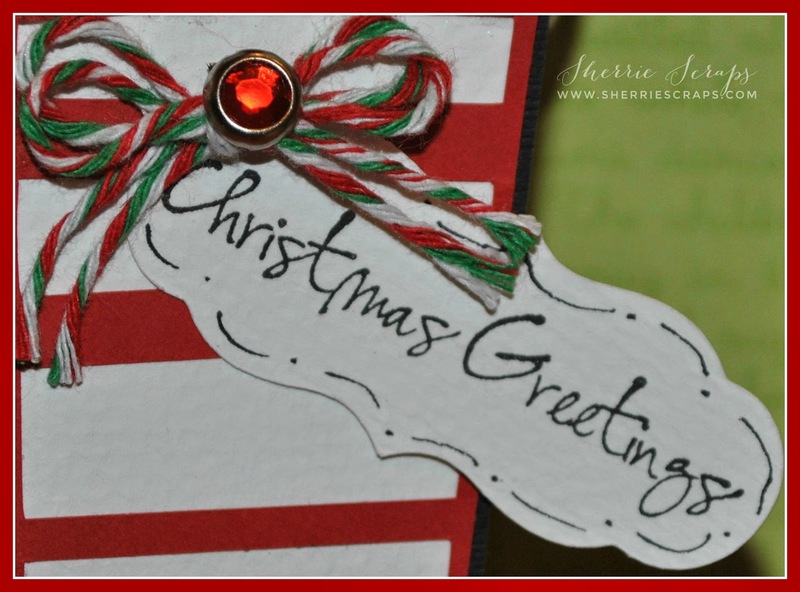 LOVE the cute color combo, great tag and overall FUN Christmas project!!!! Congrats on your Guest Designer Spot!!!! What a sweet elf stocking! These are so fun and festive, Sherrie. I love the tags and how you faux stitched around them. 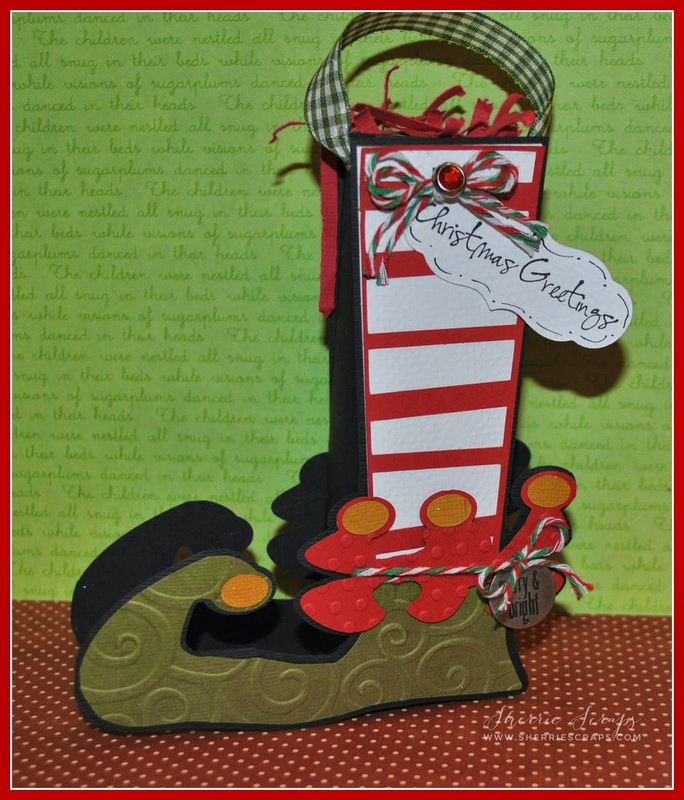 So happy you are joining us at our Guest designer this month at Sweet Stamps! What a cute treat box, love the stocking shape. Thank you for joining us this month as our guest designer, I'm looking forward to seeing what you create. Congrats Sherrie on your GD spot. Love these elf shoes. Both are too cute. Love the papers and adorable tag. So sorry I have not been by in a few weeks. I was in the hospital and sick for a week. Rested for a few days and now trying to play catch up. I'm trying to leave a comment on everyone's last post today and then over the next couple of day will visit and catch up all the post I have missed. Congratulations on your guest design spot, Sherrie!! So deserved!! Your treat boxes are amazing!! I love the fun shape!! The embossing is such a fabulous touch!! You decorated them perfectly!! These are so awesome my friend!! They will be adored by the recipients!! Congrats on your GD spot. These little treat boxes are so much fun!! The elf stocking treat box is awesome, love the shape of the box! The embellishments looks fabulous! Congrats on your guest designer spot, can't wait to see what els you create! Just wanted to pop back over and say thanks for joining our linky party over at Craftin Desert Diva's! Congrats on your GDS!! That is AWESOME! The elf stocking treat is ADORABLE!! Love the embossed portion of the stocking..very FESTIVE! What a fun way to pack some holiday treats. i love the way you did the bow and the embossing. LOve this Sherrie congrats on your GD spot. I will have to go over there and enter the challenge. Have a Blessed day, DIANA L.
Yay! I was so happy when I saw you were the guest designer. (Sorry for just getting over here) This is so deserved and your projects are just the cutest! Another fun holiday project full of lots of eye candy! Congrats on your GD spot!! So exciting!! Your box is so fun and the embossing is a fabulous touch! I hope you've found time to decorate the tree. It's a busy time but a fun time!! Congrats Sherrie on your GD spot!! Your elf stocking treats are adorable!!! Have a great day. Sherrie ~ Oh my this is just too CUUUTE! You always have the cutest things to put special treats in!! LVOE the deets too! No I have yet to start anything! We left last week to visit family ~ so catching up on stuff around here first! I must start soon so I can join you on enjoying this holiday a little more! Congrats on your Guest Designer spot! This project is absolutely adorable!! Thanks for joining our Christmas Linky Party at Craftin' Desert Diva's! Wonderful projects, these are so cute Sherrie, glad to have you joining the SweetStamps team this month. Oh my gosh - how stinking cute! 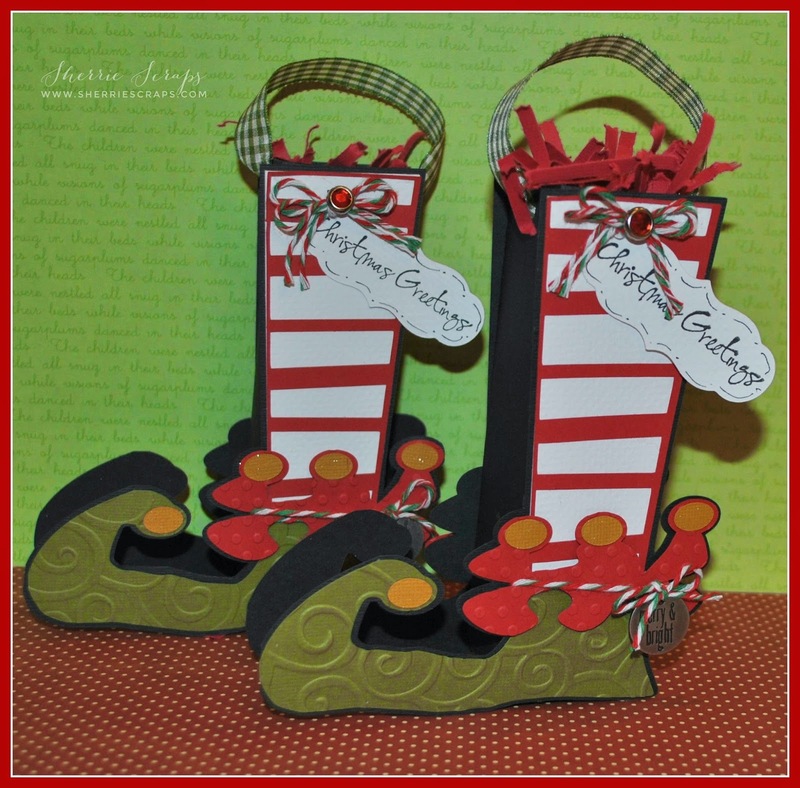 Those little elf shoes are just adorable and I love the sweet tag you created. The font on your sentiment is super pretty. Congrats on your guest spot, I look forward to seeing all of your creations! CUTE, CUTE, CUTE!!! Thanks for linking up to DTC Challenge #89! Great treat bag. I have this laid out on my computer mat so I can cut it. Hope it looks as good as yours! Congrats my friend on the Guest spot! They have some cute stamps :) Your stocking are Oh so CUTE! I love this idea....Look at this FUN project! OMG! this is such a fun and adorable project Sherrie:) Thank you for joining us over at Decorate to Celebrate! !